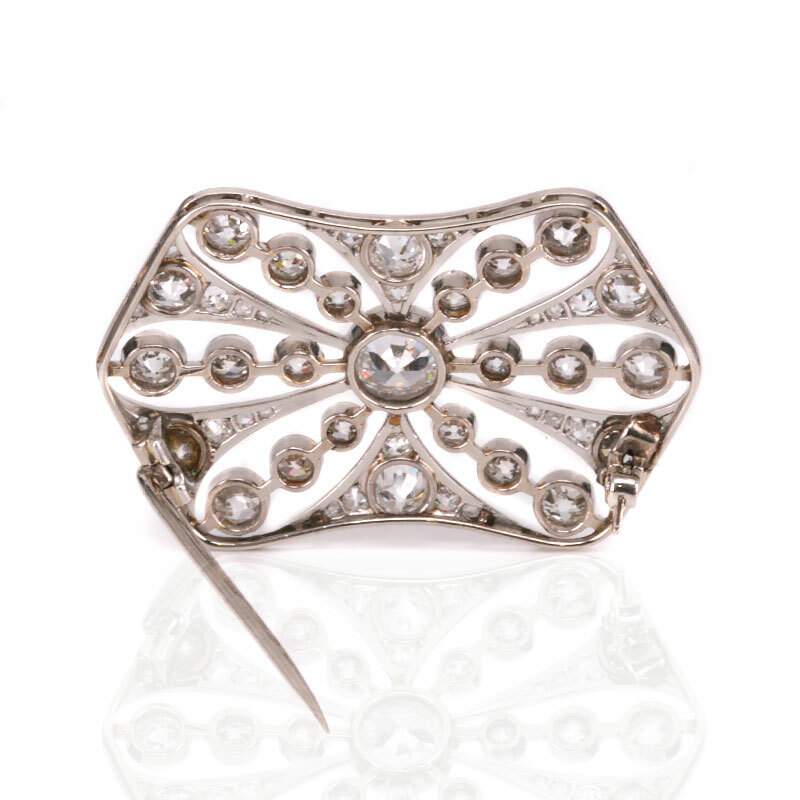 Product code: ES8381 Categories: Art Deco, Art Deco Brooch. Here is a truly exquisite Art Deco diamond brooch hand made in platinum in the 1920’s that will capture the eye of all who see it from near or far and day or night. 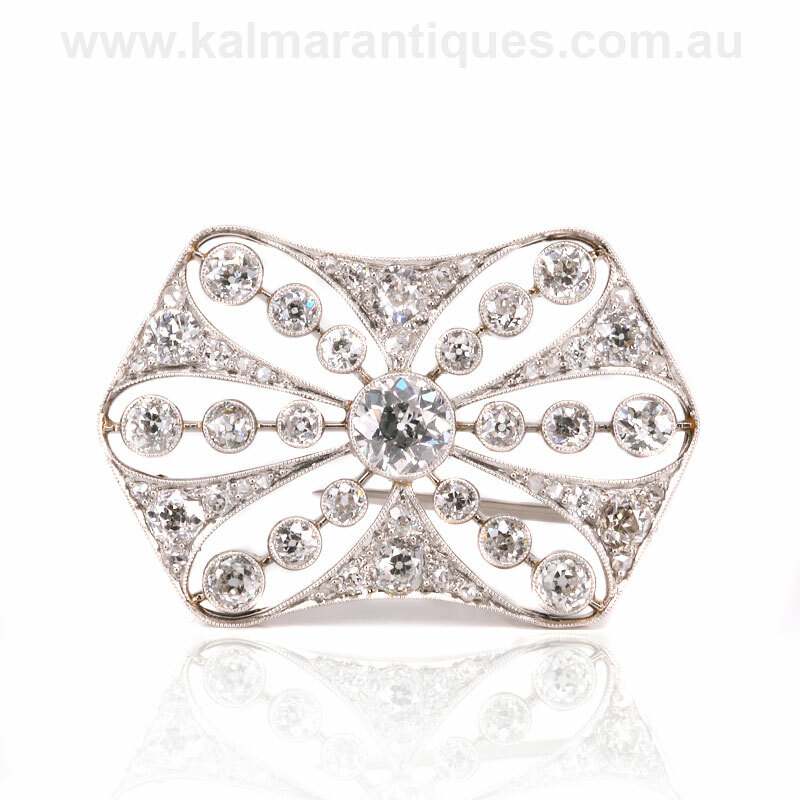 The quality of this brooch is up there with the best of the best from being hand made entirely in platinum to the way the six rows of diamonds graduate in size so elegantly. With a beautiful hour glass style design to it, the brooch measures 43mm across by 31mm and on any outfit there is no doubt that it will always be seen. Set in the centre with a beautiful European cut diamond that measures 0.94 carats, there are a further thirty four more European cut diamonds that total 3.78 carats as well as twenty smaller rose cut diamonds that total 0.14 carats, bringing the total diamond weight in this brooch to a dazzling 4.86 carats. Platinum is the only metal that this brooch could have been made out of, as it has the distinct advantage over even gold as the only precious material that can be drawn into such a fine wire, all the while being able to support and hold securely all of those diamonds. The closer you get to this brooch, the more you will fall in love with it, and this is certainly an exquisite example of Art Deco jewellery at its best. Tag: Art Deco diamond brooch. The Art Deco movement was from 1920 to 1940 and resulted in some truly fabulous designs for not only jewellery, but clothing, cars and architecture. Embracing platinum in their jewellery, jewellers used platinum for multiple reasons, some of which were the purity of platinum including the pure white colour that never tarnishes and its ability to be drawn into a fine wire all the while being able to support not only the design but any gemstones that are set into it. Art Deco jewellery is as popular today as when they were created nearly 100 years ago, and is a real testament to not only the designs but also the quality of craftsmanship that went into each and every piece.